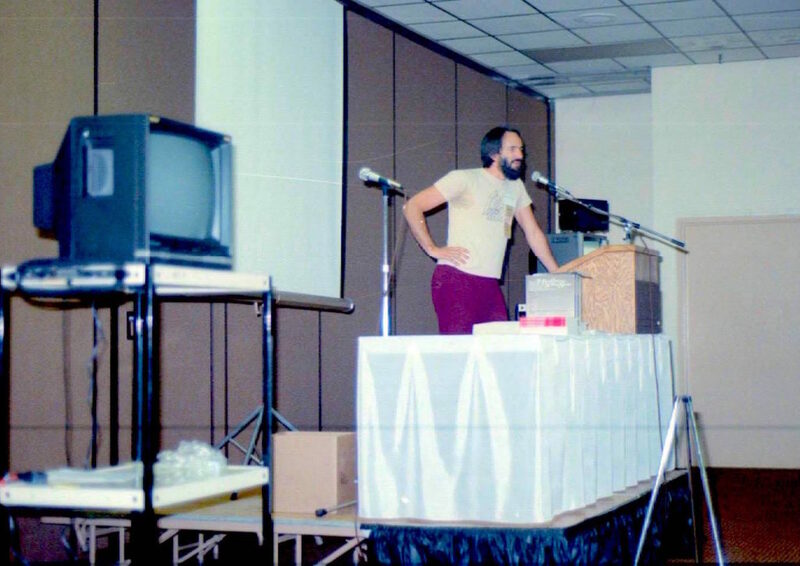 The photo above shows me giving a talk about the Computing Across America adventure at the “Computers in the Ham Shack” event in a hot room during the 1986 Dayton Hamvention (photo by Dr. Jim Grubbs, KR6EN/ex-K9EI – SK, who was session moderator). The Worldradio article below is from the July issue, but the Dayton weekend was April 25-27 so we use that date here. At this point, I was back in Columbus after the first 10,000 miles, and was yet a few months away from trucking the new Winnebiko II to Expo ’86 in Vancouver to begin the second trip. Steve Roberts, KA8OVA has been bicycling around the U.S. for a year. A professional writer, Steve transmits his stories via modem over telephone lines directly to his publishers. This was not so much a forum on how to do it, but more what can be done and what has been done. There was a wealth of information given and enough to get even the most disinterested Amateur motivated enough to clear some of the crud off his desk and plonk down a computer. The moderator of the session was Jim Grubbs, K9EI-SK. Jim mentioned that software was available to use computers for slow scan TV and a WEEFAX program was on the way. Scott Loftesness, W3VS the editor of “HamNet,” one of the services available on CompuServe, talked about what was available on HamNet. CompuServe is a professional Electronic Mail (E-MAIL) and database system. Five years ago it was opened in the evening for personal use after the professional users had all gone home to vedge in front of the TV. Today, said Scott, it is busier in the evenings. Available on HamNet is an “ONLINE” magazine, electronic versions of the W5YI Report, Gateway (the packet magazine), the ARRL Letter and tons of Ham related programs. All of this wealth of data is available for only the hourly connect charge of $6.00. Dialing into a database such as CompuServe can cost money, packet radio with much of the same stuff is free. The most interesting speaker of the forum was Steven Roberts, KA8OVA. He talked about his trip round the U.S. on a reclining bicycle. The bike was powered by Steven who was powered by 5,000 calories per day just to keep the pedals turning. 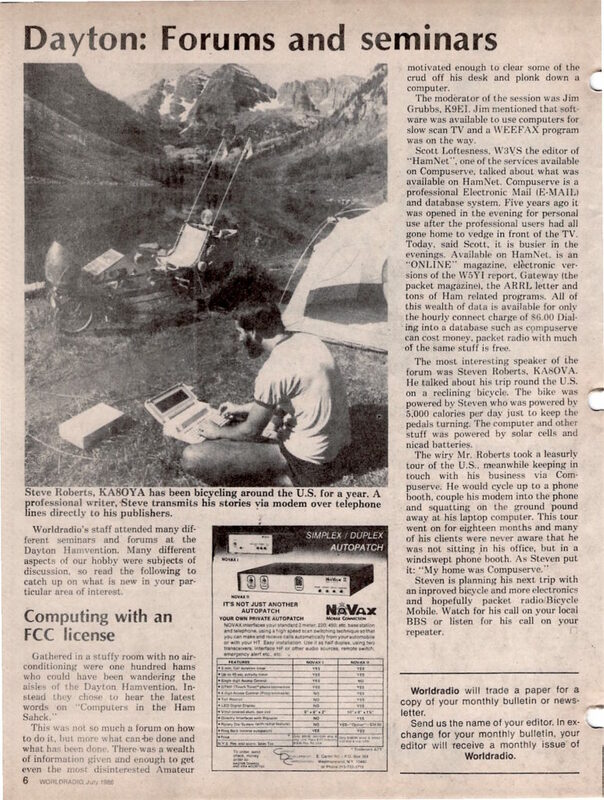 The computer and other stuff was powered by solar cells and nicad batteries. Steven is planning his next trip with an improved bicycle and more electronics and hopefully packet radio/Bicycle Mobile. Watch for his call on your local BBS or listen for his call on your repeater.